View More In Chargers & Power Adapters. With Smart IC technology, Nekmit Charger auto-detects your device's output to always charge at maximum speed (3.1A max, up to 2.4A per port). Dual USB ports support two devices simultaneously, including Apple mobile devices, smartphones and tablets. Built-in premium circuitry and microchip ensure device safety, protect your devices from over-charging, over-heating and short circuit. 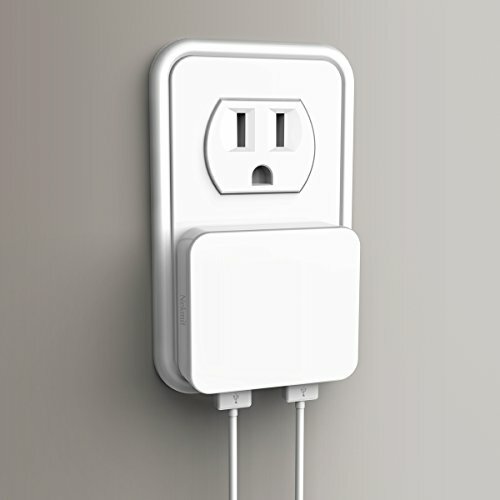 0.7 inch is slim enough to use in those awkward, hard-to-reach wall sockets behind furnitures. Its vertical USB-port access allows you to plug in cables vertically for saving space. Designed to work with iPhone/ iPad/ iPod/ Samsung/ LG/ Motorola/ Sony/ HTC/ Nexus/ PSP/ MP3/ MP4/ Kindle Fire/ Google Nexus Tablet and nearly any other device that charges with a USB cord. At Nekmit, we back our products all with 12-month warranty and provide friendly, easy-to-reach support. If you have any questions about this product by Nekmit, contact us by completing and submitting the form below. If you are looking for a specif part number, please include it with your message.